My little slice of Alabama’s championship season. There are a lot of factors that go into developing The Perfect Agency. But the ultimate goal of creating such an ad agency is to create the right conditions to consistently generate great work that has a meaningful impact on the clients we serve. Just before the college football season began this fall my team and I were working feverishly to bring a really exciting new campaign to life for UPS. The basic premise of the project was that college football has a tremendous economic impact on college football towns. So we profiled these great towns that often double in population thanks to the pilgrimages that occur on football Saturdays. We talked to local businesses and they shared the opportunities and challenges associated with the swelling demands of game day. And I was proud to hear business owners declare that our client, UPS, played an instrumental role in enabling them to meet those demands. Thanks to this campaign my football season started in Tuscaloosa, Alabama last August in 99 degree heat. We spent two days covering the town, the school, the Crimson Tide football program and the local small businesses. I came away with a real affinity for the town, the beautiful campus, and the people. I also developed an even deeper admiration for the championship caliber football program. And since we brought a film crew with us I left with a video that summarized it all in about 60 seconds. And because my phone has a camera, I’ve included a few images from the experience below. Congratulations to The University of Alabama on your fourth national championship in seven years. And thanks for offering us such a great story to tell. Roll Tide. And roll the video. Me at the end of a very hot day. I was surprised to find they had hung my initials on the columns to welcome me. I beat Nick Saban in a heated game of Rock, Paper, Scissors. Bear Bryant. The bird that tarnished his fedora was deported. If you’re ever in Tuscaloosa stop by Dreamland for some dreamy barbecue. And if the contacts start moving in your eyes football isn’t so simple. Let there be light. And Alabama football. And a flag. And maybe an umbrella. It was hot. 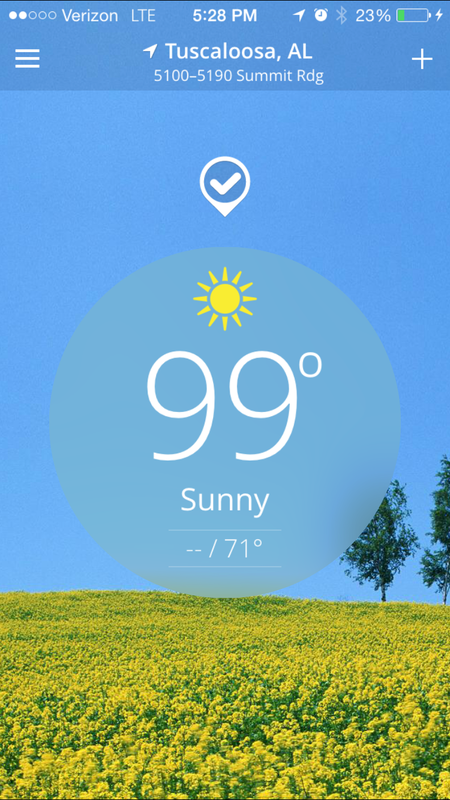 Not triple-digit hot. But close. The Black Warrior River at sunrise. This photo may be upside down. You don’t want to hear me drone on about our drone. Posted on January 12, 2016 Categories advertisingTags advertising, Alabama, College Football Town, Crimson Tide, Football, National Championship, Tuscaloosa, UPS5 Comments on My little slice of Alabama’s championship season.